These days, to get a peacock fix, we go to the zoo, where the peacocks are still free-range, and the poop is someone else’s problem. They’re beautiful birds, and one of the first subjects I wanted to draw when I thought about designing my own embroidery. 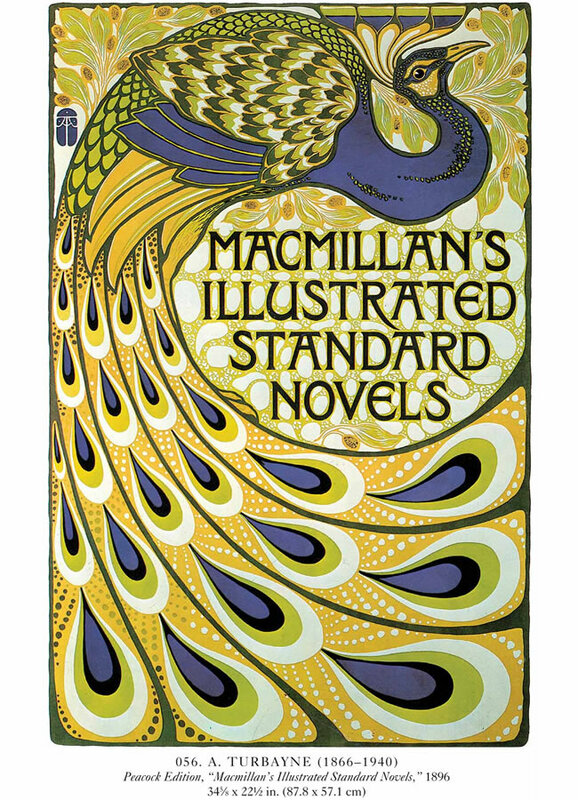 Their feathers are on the right side of gaudy, and call out for shiny metallic threads. Here are two peacocks I’ve come up with. I used stem stitch for the head and neck, satin stitch and outline stitch for the body, bands of satin stitch for the wings, and satin stitch and stem stitch for the tail. The branch is stem stitch, and the flowers are done in buttonhole stitch. I’m very pleased with how this turned out. The second peacock (also sitting on a flowered branch!) is mounted in a [4″] wooden hoop. I have some beautiful Hanah hand-dyed silk ribbon; it was gifted to me, and the ribbons aren’t tagged. I’d guess that it’s Sapphire, maybe, but I’m not sure. I used that ribbon to make a stumpwork tail, using more Kreinik metallic thread, then shredded the ends of the ribbon. The body is stem stitch (a favorite of mine, whether as an outline or a filler stitch.) I used two strands of blue, then one strand each of blue and teal, then two strands of teal. Were I to do this again, I might paint the hoop gold, to more closely match the stitching on the tail. 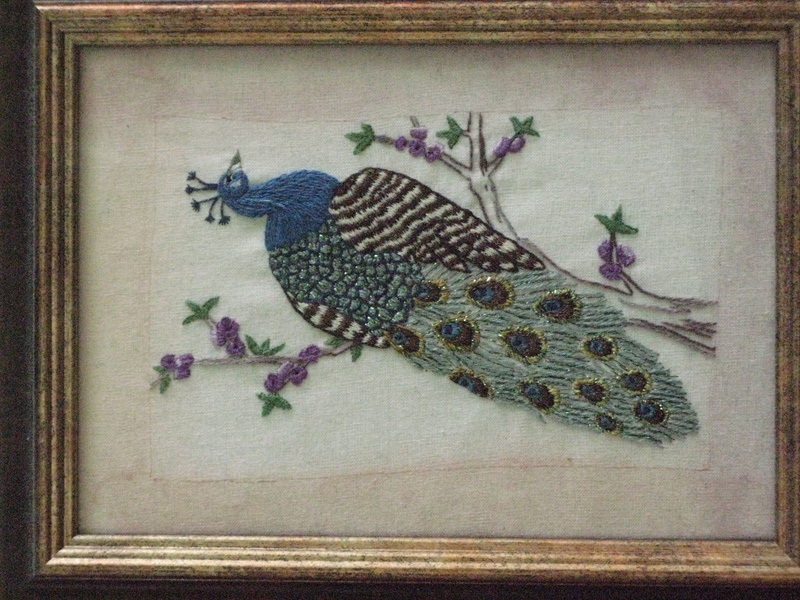 This entry was posted in Uncategorized and tagged crafts, embroidery, peacocks, surface embroidery by Rene. Bookmark the permalink. Thank you! They are very loud indeed. Good thing they have their looks going for them. I love the one with the ‘sticky-out tail’, too. 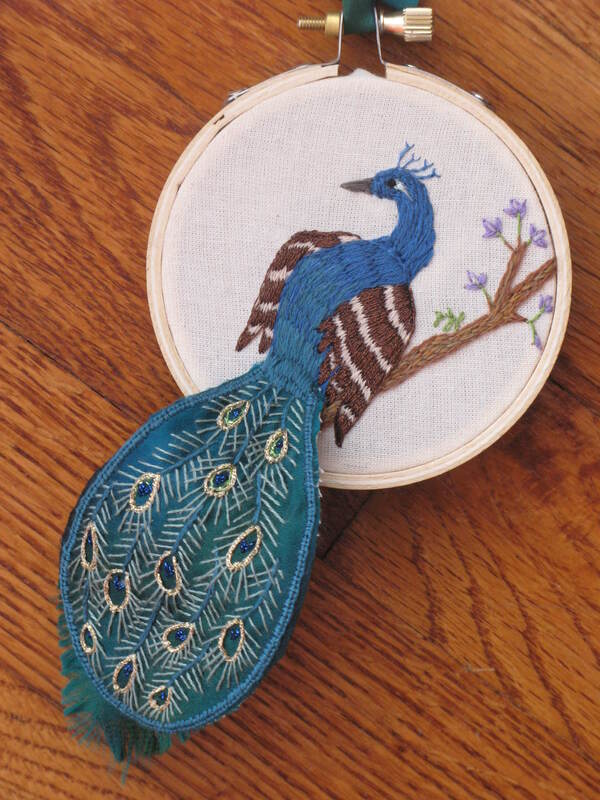 The tail draws the eye into the main part of the embroidery. Thanks, Janet. I’m trying to think of more projects that will use this lovely silk ribbon. It seemed perfect for such beautiful feathers.